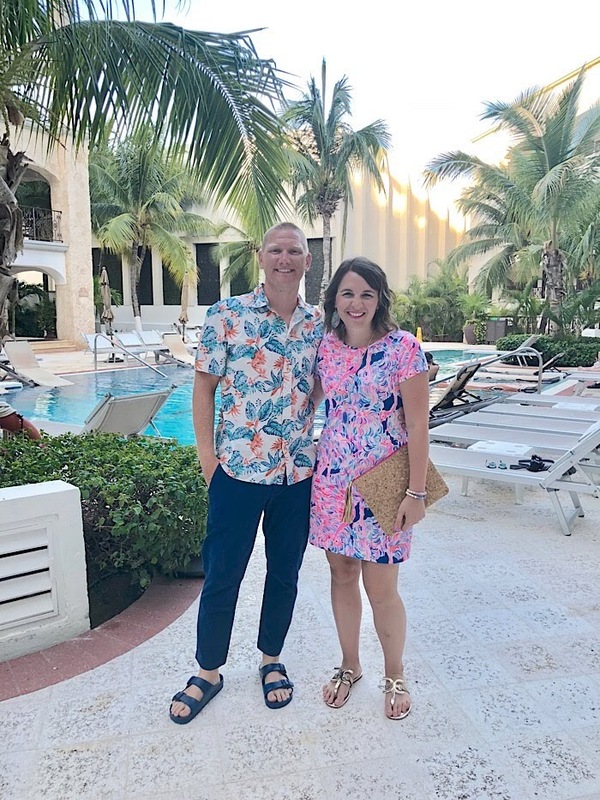 We returned last week from five nights at The Royal in Playa Del Carmen, Mexico. This is our third year staying at this same resort. We visited it first to celebrate our 10th Wedding Anniversary and decided we need to take a trip just the two of us every year. This is what I wore to dinner they first night. We got to the resort at about 3 pm. 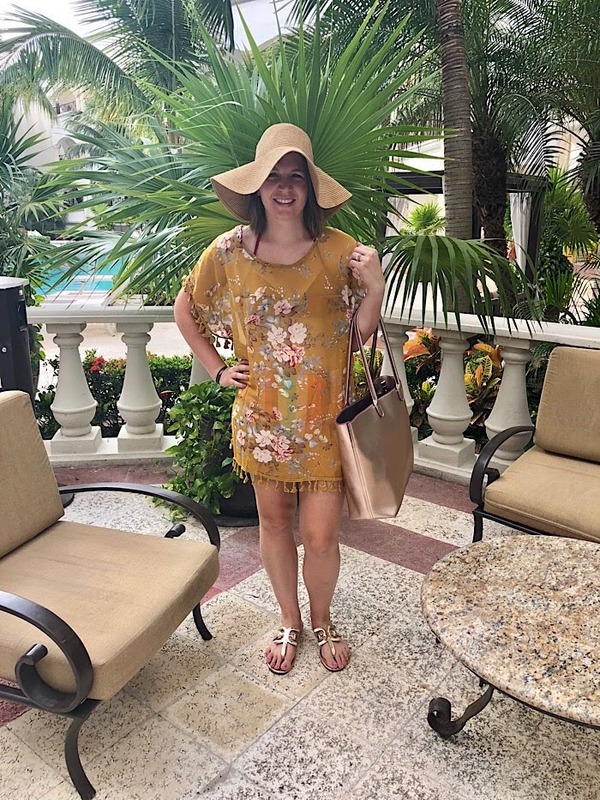 got checked in, dressed, and walked around the resort. The past two trips I've taken wedges, but since there is a bit of walking from place to place, this year I went with all flat sandals. I may change my mind next year because you do lose a bit of that dressy look with flats, but sometimes comfort trumps fashion. This was my uniform most of the time during the day, a swim cover up, my suit (which I'll talk about more below), this bag, and my Sam Elderman sandals. I rotated back and forth between these, my Tory Burch Millers, and my Target "birken-crocks" (which are no longer available, but these are similar). 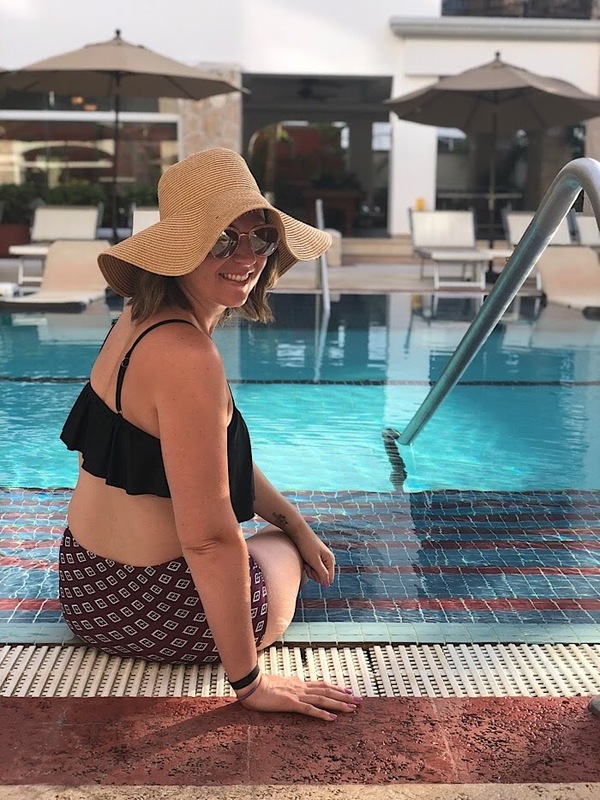 We spent most every day by the pool, leaving for a while to grab a bite to eat at one of the resort restaurants. This was my dinner outfit for the second night. You've seen this dress before here. 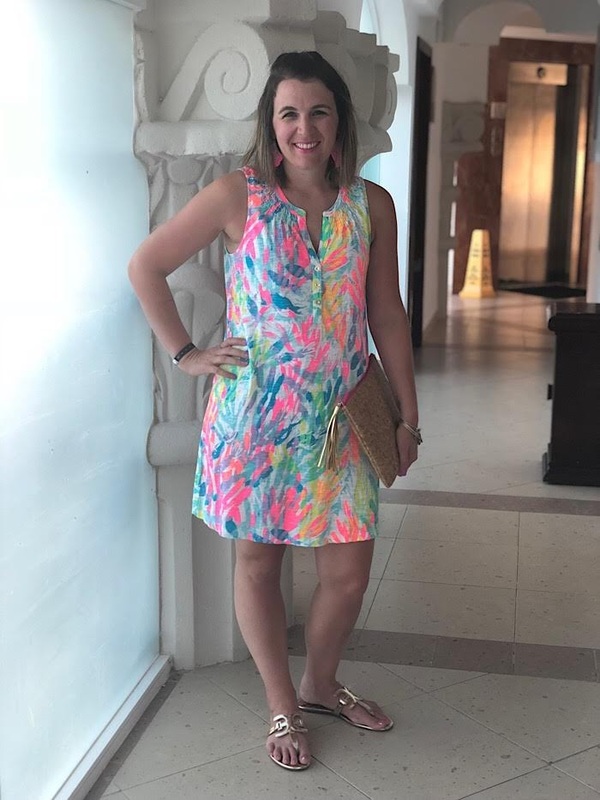 I am loving the bright Lilly Pulitzer prints and this print, Sparkling Sands, is probably my favorite. Here's my outfit from night number three! This evening we met up with a childhood friend of Russ's who was in Mexico, too. I didn't want to be too fancy because we were walking the outdoor market area with them. And thank goodness for my travel steamer to get the wrinkles out of this dress! Not a ton to say about this, but it's another swim cover up. I went with a basic black cover up since the hat was a little loud. I also had a black and white striped cover up I wore last year. 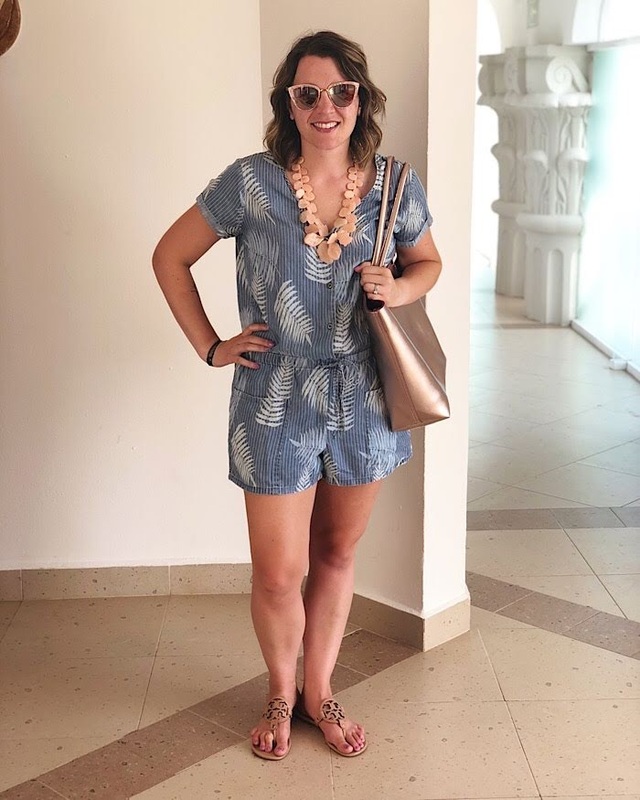 This outfit is similar to the other Lilly Pulitzer dress outfit. I kept the accessories simple and let the print of the dress speak for itself. Russ wore a lot of shorts and button ups or basic tees. This outfit was a step outside his comfort zone with the cropped pants, but can you believe he picked them out for himself to wear on our trip? As for swimsuits, I wore high-waisted two pieces the whole trip. I got the one I'm wearing in this picture from Amazon. I also have some pieces from the Sand and Shore line from Target (this bottom and this top) and some older items I've mixed and matched. The suits I've found make me feel comfortable but also are a little fun! This was the last night. 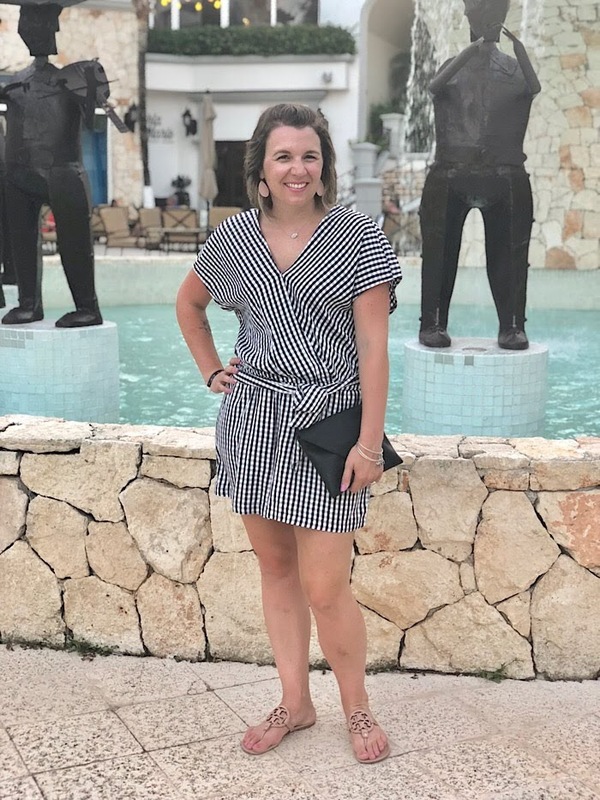 I found this romper on the Gap sale rack, and I was excited about it. It's a little different, but fun. I went with blush details because of my sandals, but I could totally see myself dressing this up with some bright colors too. 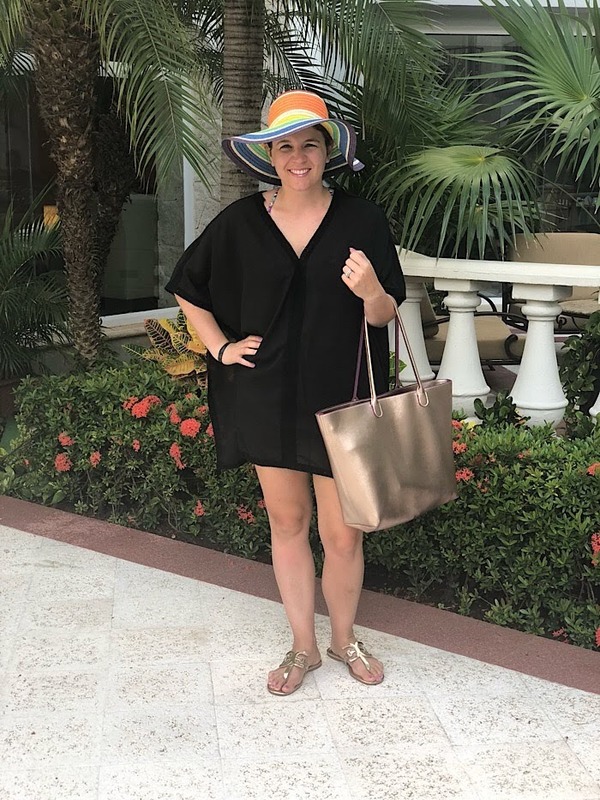 So, there's a recap of my outfits from the trip! 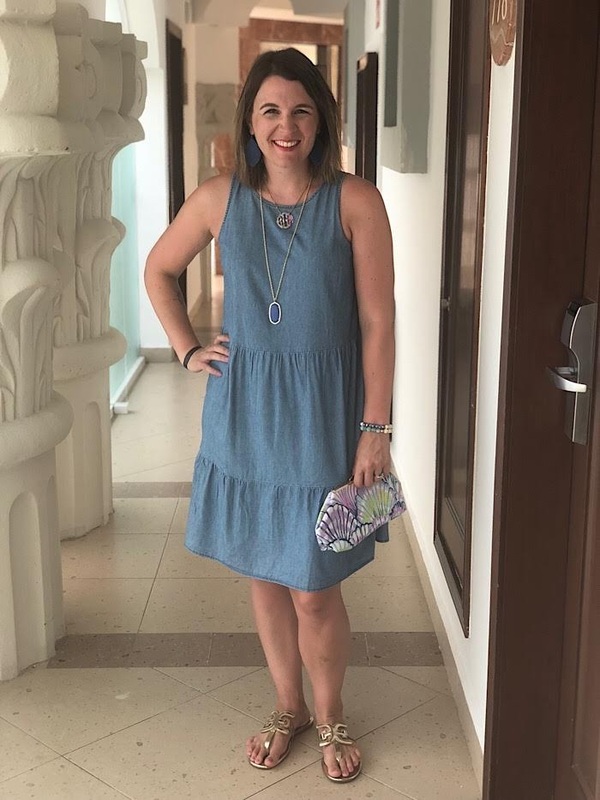 It's fun to get all dressed up and relax without kids around! Which outfit is your favorite?